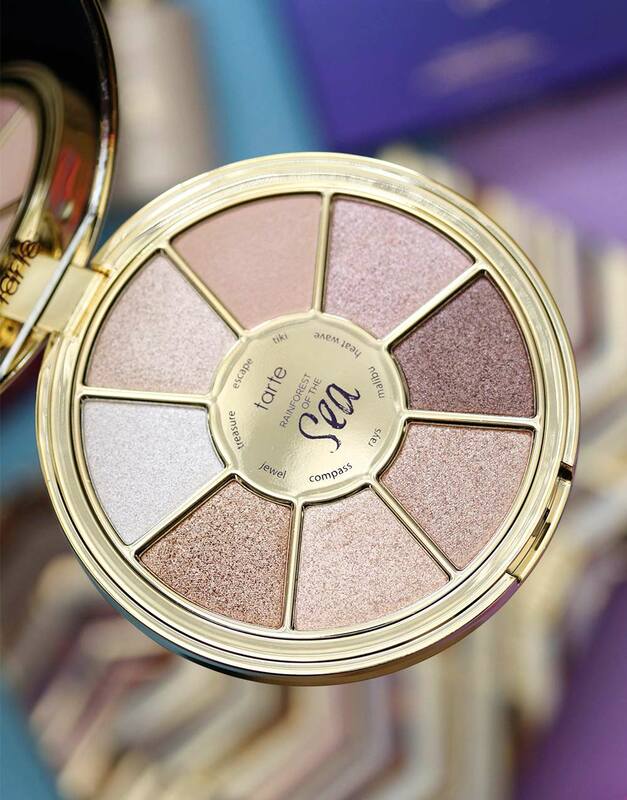 I’ve always been intrigued and a little bit confused by the name of Tarte’s “Rainforest of the Sea” palettes. Because it’s a little confusing, right? I picture a rainforest literally emerging from the sea like an Amazonian Atlantis, or something from a kids cartoon. There’s absolutely no way sober people came up with it. 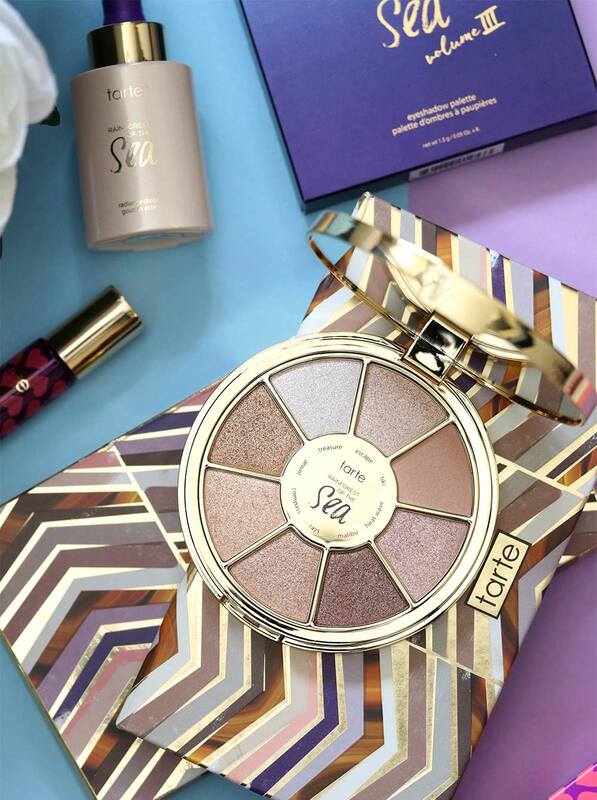 Tarte’s latest color canopy, the Rainforest of the Sea Volume III Palette, is available now for $36. Yup, they made a third one! I don’t know if you remember the second one, but I thought it was epic. EPIC. I never tried the first Rainforest of the Sea palette (my friend Jessica reviewed it for MBB), but I love the heck out of the second one and its beautiful, buttery, satiny blues and browns. They’re to die for and so creamy. Easy to blend too. Volume III is more metal. It has seven high shine metallics and one matte beige. Like Volume II, the shadows are a super creamy combination of a powder and a cream, and they feel slightly bouncy, so you can practically blend them in yo’ sleep. Or, when you’re half-awake because you didn’t get enough sleep, ha! I’m wearing Jewel and Rays mixed together on my lids, and Tiki in the crease. The lip is NARS Powermatte in Get It On topped with MAC Lipglass in Goldfinch. 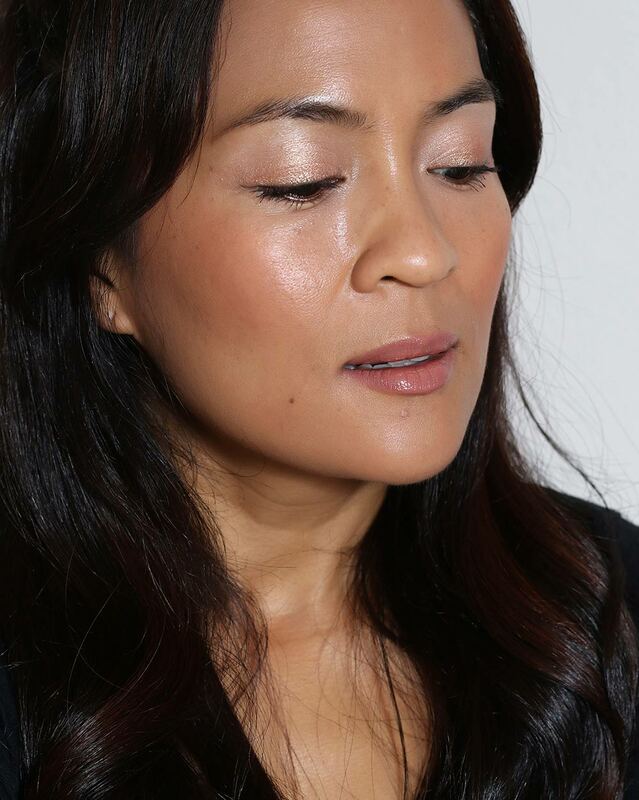 Cheeks are MAC Sunbasque Blush. I’ve been enamored with copper, bronze, gold and rose gold lately (lately for years), and I’d hoped this palette would allow me to add little of my metal choice du jour on my lids with a blending brush, throw on some liner and mascara, and then proceed to #livemybestlife (which, these days, includes Googling things like “Why is my toddler touching her poop?”). The thing is, these shadows are messy as all heck to apply. I mean, not old-school Urban Decay or NYX shadow messy, but messy enough to make make me remember to always do my eyes first with them (which I’m glad I did today). I think they’re gorgeous and might even make my eyes look brighter when I wear them. Plus, they don’t budge for at least seven hours when I layer them on top of Tarte Lid Lock. The Rainforest of the Sea family products all contain something Tarte calls their “Rainforest of the Sea Complex,” a blend of algae and marine flower extracts that are supposed to make fine lines and wrinkles less noticeable when you wear ’em. I get it. These are highlighting shadows. But they also highlight my lines, oy! 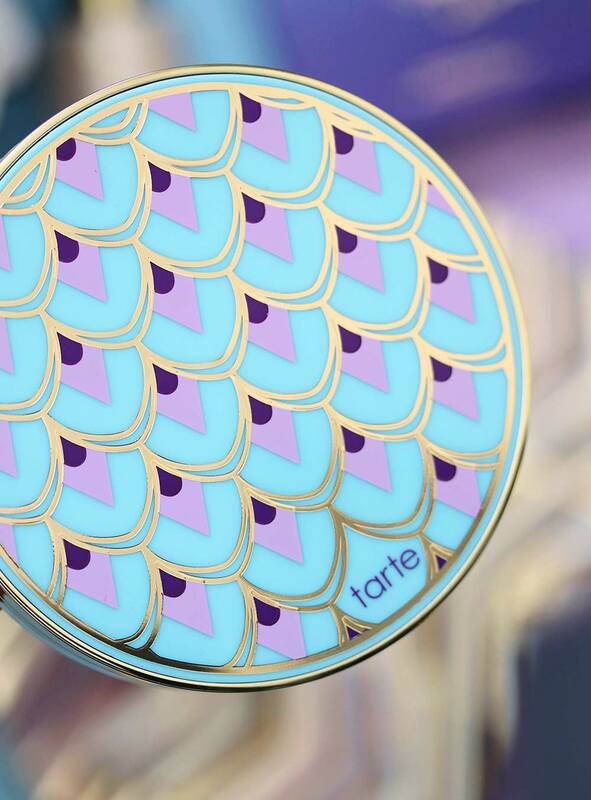 I love the creamy consistency and the colors, but I wish Tarte had stuck to their satin finish, instead of going full-on metallic. That said, if you aren’t trippin’ over lid lines and don’t mind making a bit of a mess, I say go for it. It looks beautiful on you, but I can’t do shimmer like this anymore. Do you know if the Raifirest of the Sea volume 2 is still available? All three volumes are listed as being available on the U.S. Sephora website. Clearly your idea of not getting enough sleep is different than my actual experience, because I look like I’ve been beaten up overnight when I don’t get enough sleep and you look just plain gorgeous in that photo. It’s like when I roll into the gym at 8:30 and this gal who is a hairdresser is there, already half way through her workout and she looks gorgeous with her curly blonde locks and perfect makeup. And I look gray and comatose. I have the original RofTS palette and hardly ever reach for it, so I didn’t bother to splurge on II. I know its because it’s round and it doesn’t fit in the drawer with all my square or rectangular palettes. Maybe I’ll play with it this weekend. 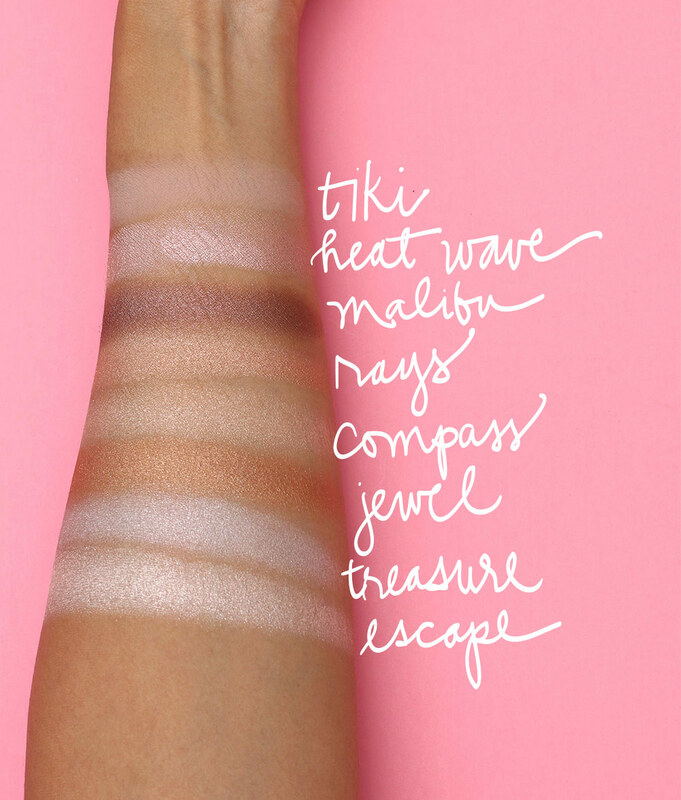 I’d have to swatch but I like what I see. I really don’t need more shadows, but I don’t have a ton of neutrals. Oh, yes, I could see the frosty immediately in your first pan pic. I think the cover is really cute, though. And I hear you on the name. Rainforest of the Sea makes me think of Chicken of the Sea. Which, then makes me think of Chicken of the Cave. So, I end up laughing because who doesn’t love some Anchorman? HAHA! I have been lusting after this palette since it was released. I have one and two in my collection, so I assume I have been wanting it pretty much only for wanting to round out my collection. I typically wear cream eyeshadow, so in no way do I need it. Thank you for a great review!